Here is my verdict and review after using it for a week now on the best seller in USA iPhone case, The Otterbox! Beign a very clumsy person, yes I always drop things, especially my phone! Usually my iphone case are the plastic type of casing, so when it drops, the the percentage of my phone gonna broke or something is higher. Anothe things, my open holes of my phone are exposed to dust and water. so its a simple thing that we dont really look at that actually can cause damage to the phone it self. Otterbox save my iPhone from all that! 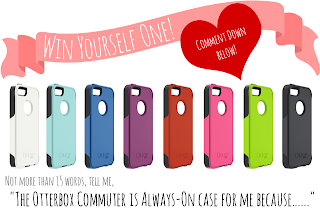 Now its your turn to win one Otterbox Casing worth RM90+ each! "The Otterbox Commuter is Always-On case for me because......"
and hashtag #OtterboxCommuter in the comment. Giveaway ends by 10th November 2013. You will be judge by Otterbox team it self and winners will be announce on 15th November 2013 by them. *Giveaway open for Malaysia resident only. Go to below picture in my Facebook page and comment! CLICK HERE TO GO TO THE PICTURE TO ENTER! It looks so tough and sturdy! Visit my page for reviews on the UK edition of Maybelline's Color Tattoos! Wow...I did not know about Otterbox phone casing until I read your post. The mint green & pink cases are so pretty.